In September 2014 Amazon announced the Amazon Picking Challenge, a new robot manipulation contest as part of the ICRA robot challenges. The idea was to take a difficult problem from the warehouse order-fulfillment industry and see how far contestants can get applying innovative robotics research. The challenge is centered around a problem the robotics community has been chipping away at for decades: picking various, distinct items off of a shelf under uncertain conditions. The location of the item is only known within a few dozen centimeters, and only vague high-level information is known about the item itself. The challenge description has obvious roots in warehouse fulfillment, but this is clearly a generic task robots need to get better at to be useful in a variety of everyday contexts. When inventory comes into an Amazon warehouse it is singulated (pulled apart into individual items a customer might purchase) and stocked into shelves, and the location of the item is tagged in a warehouse management system. Later, when the item is ordered, a person is directed to the shelf that contains this item and picks it off. Shelves are often stocked as densely as possible to maximize the value of the warehouse. In a system that handles millions of different products, it is economical to store a variety of items in the same space. The resulting mixed and cluttered bin is relatively easy for a human to work with, but poses a challenge for traditional automation systems. We might have an idea of what the item ordinarily looks like beforehand, but perhaps this time the packaging has changed color, the manufacturer has added an extra plastic bag to protect it, or it is folded in half inside the bin. Products in an Amazon warehouse have a wide range of visual and physical properties. A real product is rarely just a simple brown cardboard box. It could be a large stuffed animal, a floppy bag of rice, a package of cookies (cookies are more appetizing in their un-crushed state), a necklace, or a small USB stick. The goal in creating this challenge was to clearly define a simplified but applicable version of the real world problem. 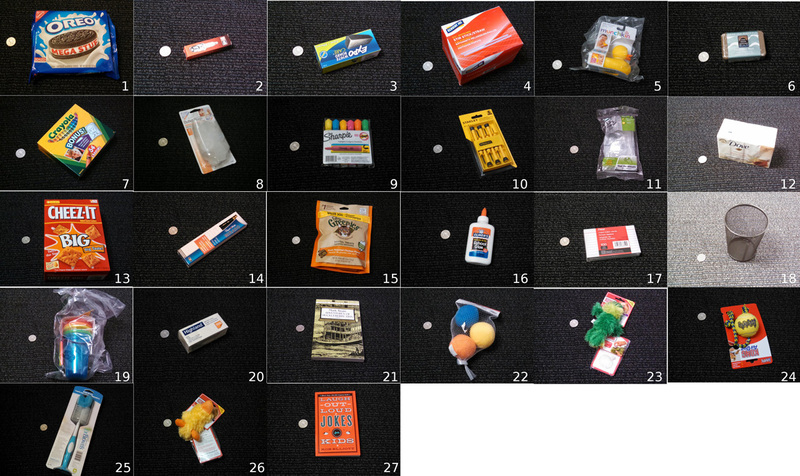 The ICRA challenge lists 27 different items that will be randomly stocked inside of a pre-defined shelf structure. The challenge carefully avoids putting constraints on the solution space. The goal of this first challenge year is not to drive toward any one specific software or hardware architecture, but to provide the robotics community with a difficult, real-world problem. The human arm has 7 degrees-of-freedom, but is this really the best configuration to complete such a task? Robot end-effector designs are undergoing a renaissance (as evidenced by the variety of new gripper companies appearing each year), but which design fits well in tight spaces? Perhaps calling this the ‘Picking’ challenge was misleading. Pick and place is a convenient categorization for robotics, but observation of human strategies in these tasks has shown that human manipulation is far more nuanced than the simple approach-grasp-retreat paradigm we traditionally see in a robot. Humans take advantage of many different environmental constraints to perform the task effectively. The response from the community so far has been fantastic. Over 150 people have signed up for the contest email list, and three robot distributors have agreed to bring base platforms if necessary for teams that can’t bring their own bot (Rethink Robotics with the Baxter Research Robot, Clearpath Robotics with the PR2 Robot, and Olympus Controls with the UR5). We hope this is the beginning of a fun and fruitful event that helps bring together subdomains of robot manipulation to accomplish some very cool tasks. We look forward to seeing everyone at ICRA in 2015! The first deadline for the challenge is to submit a video this year to receive free challenge supplies in the mail (items and a shelf). Learn more at: http://amazonpickingchallenge.org.